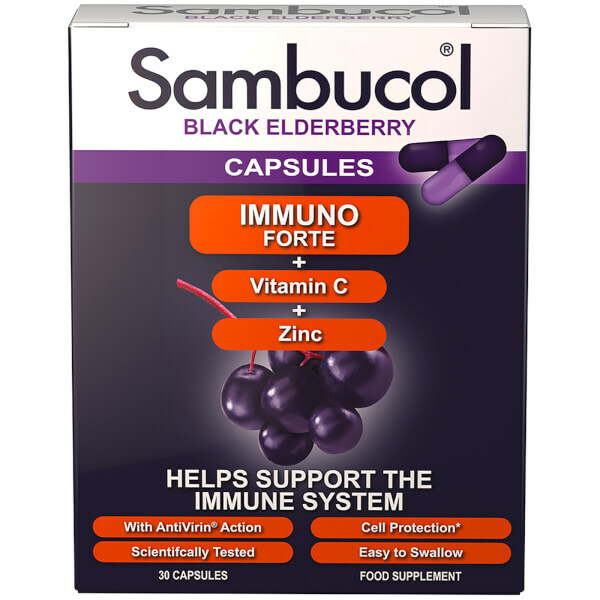 The Sambucol Immuno Forte Capsules are a health supplement that can help to support your body's natural defences. With an AntiVirin® action, the tablets are rich in vitamin C, zinc and antioxidants which can maintain your immune system. Easy to swallow, the capsules are gluten free and non-drowsy. Suitable for ages 12 years+. - L.M. Recommended Daily Dose: One capsule to be taken daily after food with a cold drink. Not to be chewed. Winter Dose: Two capsules a day. 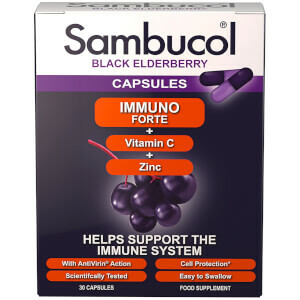 Capsule Shell (Gelatine, Colours: Erythrosine, Indigo Carmine), Bulking Agent: Maltodextrin, Freeze Dried Black Elderberry Juice (AntiVirin®), Ascorbic Acid (Vitamin C), Zinc Sulphate, Disintegrant: Magnesium Stearate.